DEN: Should local newspapers run press release feeds? Rather than re-writing certain press releases from local organisations and authorities, Singer said, newspaper websites could re-publish these releases untouched with their origins clearly marked. This system should be in place in a designated section of the site clearly marked up as ‘press releases from Lancashire Police’ etc, and could even be a simple link to an organisation’s website or an automated RSS feed of releases. Journalists at the paper would then have more time to follow-up on the facts behind the releases and put ‘news’ from organisations into context for readers, said Singer. The idea was welcomed by some in the room, dismissed by others, who felt that republishing press releases could compromise editorial standards, even if the releases were clearly marked as not from the paper’s staff. Yet others agreed that this could be a time-saving function of websites and help attract readers to the newspaper’s site as a first port of call for all local information. So which titles are doing this already? Wrexham’s Evening Leader has a list of links to local authority sites – providing the information on the site, but without the problem, raised by some editors, of running unedited releases from organisations. The paper has a widget to receive RSS feeds from the North Wales Police website, which keeps it up to date with its latest press releases. Visitors to www.eveningleader.co.uk can follow a link from our navigation bar to find the page, Christian Dunn, the site’s editor, explained to us. “It was one of our first experiments with embedding a widget on a section of our site. After listening to some of the ideas from the Digital Editors Networking event I’m going to make more of the section and talk to North Wales Police to see if there is any other material we could display for them,” he said. The Teesside Evening Gazette has its own take on Singer’s idea: its network of postcode-based hyperlocal websites link out to local community groups’ websites and local authority sites. They also link to BBC weather reports, which can be filtered by postcode too, rather than creating their own weather widgets or feeds. Outside of the UK, the Knox News Sentinel provides feeds of political news and national news straight from the Associated Press and PR Newswire – and clearly labelled as such. While this isn’t specifically local info, it does take the onus off reporters at the Sentinel from having to repurpose this content. This can’t be an exhaustive list of site’s putting Singer’s idea in to practice, so who else is doing this – in the UK or elsewhere? And does it work for you? This entry was posted in Events, Newspapers, Online Journalism and tagged Associated Press, BBC, Chair, Christian Dunn, editor, Evening Leader, Jane Singer, Knox, Lancashire Police, Local, North Wales Police, PR Newswire, RSS, Sentinel, singer, The Sentinel, The Teesside Evening Gazette, UCLAN's Johnston Press, United Kingdom, University of Central Lancashire, www.eveningleader.co.uk on October 8, 2008 by Laura Oliver. Hurricane Gustav, which according to Breaking News Twitter reached the coast of Louisiana at 11.19am (BST) today, is being avidly blogged, twittered and mapped by US news organisations online. The Houston Chronicle has set up a special section of its site – Hurricane Central – to cover the storm, featuring live radar maps of its progress, forecasts of the storm’s path and related news stories. The Chronicle has also created a guide for readers on how to prepare for the hurricane when it hits. 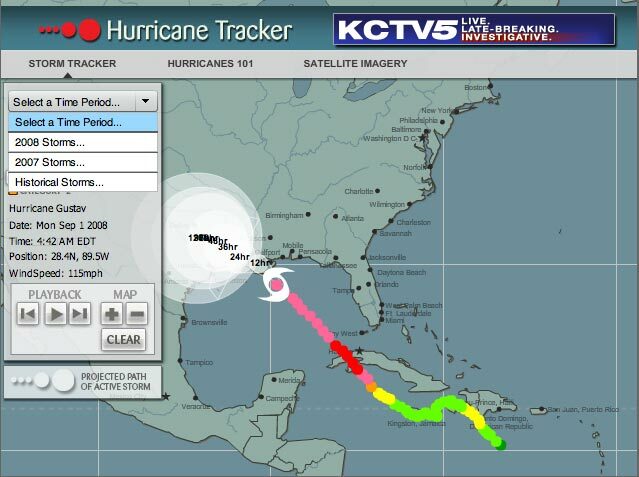 Kansas City’s KCTV5.com is mapping Gustav with its interactive Hurricane Tracker, which allows users to compare and contrast past storms in the US. KCTV5 is also streaming live footage from cameras located on the US coast. A quick search for New Orleans on Twitter Local shows a wealth of residents using the microblogging service to update on their evacuation or as they sit out the storm. Weberence has created a round-up of twitterers affected by the hurricane giving a highly personalised account of the storm; while a Twitter account set up as the American Red Cross is giving followers up-to-the-minute details of evacuation procedures and safety information. This entry was posted in Online Journalism and tagged American Red Cross, effect, Houston Chronicle, Hurricane Gustav, Hurricane Tracker, Jack Lail, Kansas City, Knox, location, Louisiana, Mapping, Mark Mayhew, New Orleans, New Orleans' airport, online media, Paris, The Chronicle, The Houston Chronicle, Twitter, United States, US coast, USA, Willow Nero on September 1, 2008 by Laura Oliver.